This is a simple diagram of my home network that I use to investigate capabilities and functionality of various Microsoft products. They’re virtualized systems running on a single HP Desktop PC which is running Microsoft’s Hyper-V on Server 2008 R2. All of the servers have now been updated to Server 2008 R2. 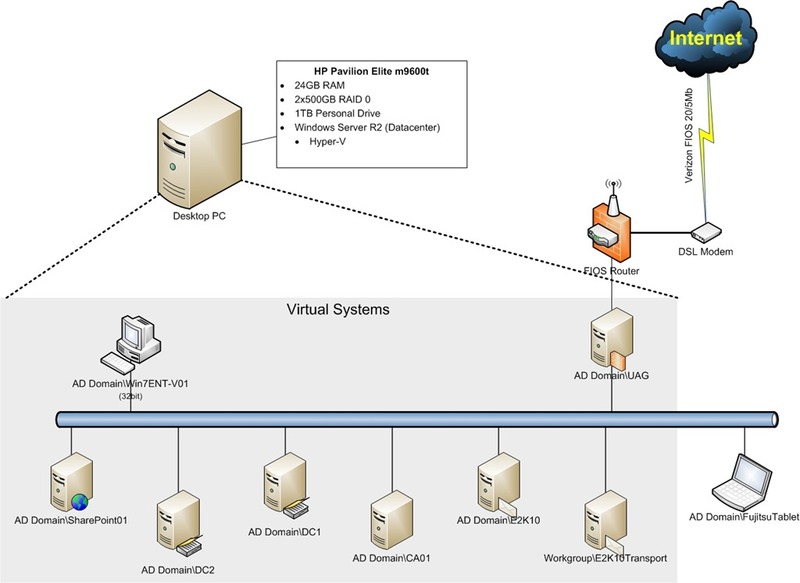 The virtualized systems consist of a couple of AD controllers, Exchange server 2010, Exchange Edge Server 2010, SharePoint 2010, Unified Access Gateway/Threat Management Gateway and a Windows 7 Enterprise edition client. These are hooked up through my FIOS connection (20Mb/5Mb) through a Firewall/Router/WAP. That means I have in effect two firewalls between my systems and the Internet. I have a TechNet license so as to be able to do all of this. I’m also able to download and use the various OSes/applications including Beta versions, for this network, for test and evaluation purposes.